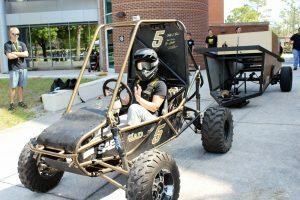 Don’t miss Wednesday’s Engineers’ Fair, 10 a.m. – 2 p.m. at the atriums of Engineering II and Harris Engineering Center. You can build and fly a balsa glider, measure your heart rate and oxygen saturation levels, build a water filter using homemade materials, race a derby car and take part in a variety of other fun, interactive activities designed to demonstrate engineering principles. On Friday, students will battle it out in college’s version of Junkyard Wars as they use provided materials to build a Rube Goldberg-like machine, a working contraption designed to perform a specific task. Stop by between 11:45 a.m. and 5 p.m. to see what our student engineers create. All events will be held on UCF’s main campus and are open to the public with free admission. First Steps to be a Leader, 3 p.m. – 4 p.m., Harris Corporation Engineering Center, Room 101. Join fellow students for a presentation on how to be a great leader and teammate.